When Courtney, from R•Home magazine, got in touch with me about doing a chair for her daughters’ lounge I had the perfect piece in mind. I had given it the nick name of the “granny chair” because with the current upholstery it looked so old (and not in a good way!) 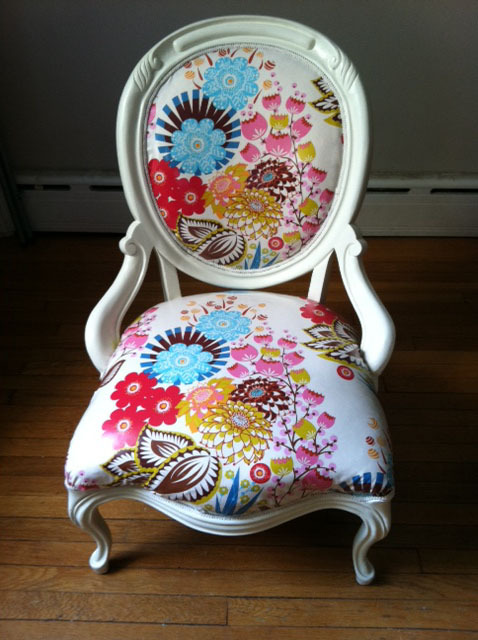 But I knew if I painted the dark wood, and put on some cool fabric, this chair would be amazing. It has such a cool shape – low to the ground, and springs in the seat that make it super comfy. 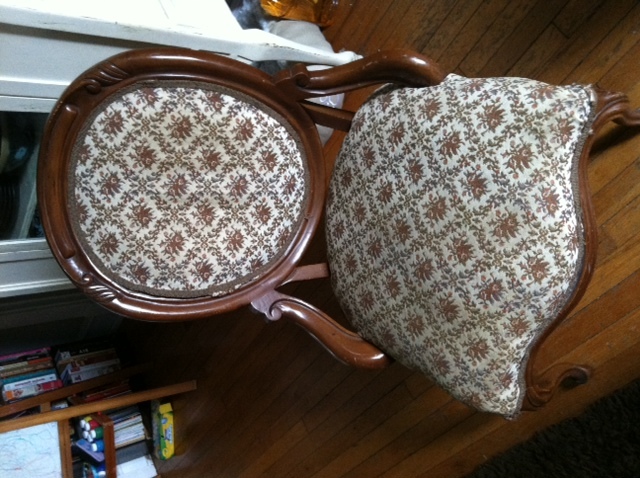 I sent Courtney this picture of the Granny Chair and she agreed to go for it. Either she really trusts me or she has a great imagination! Courtney and I started talking about fabric. 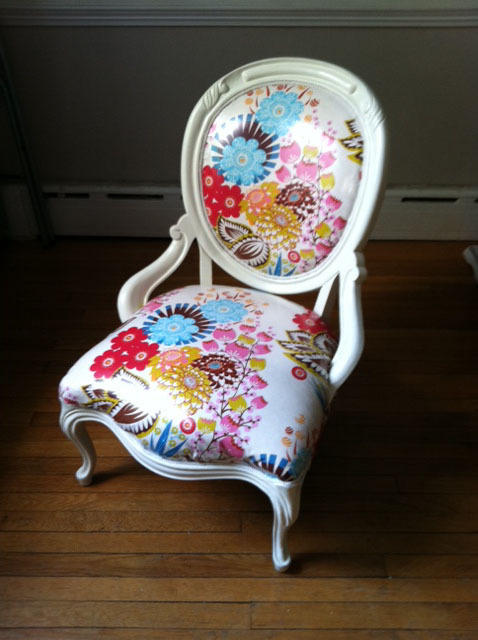 She told me the colors in the room and then she asked if I had ever reupholstered something in oil cloth. That might sound strange, but I totally understand where she was coming from! With kids you always worry about how long it will take them to destroy your furniture. But I had a great solution in mind – laminated cotton. 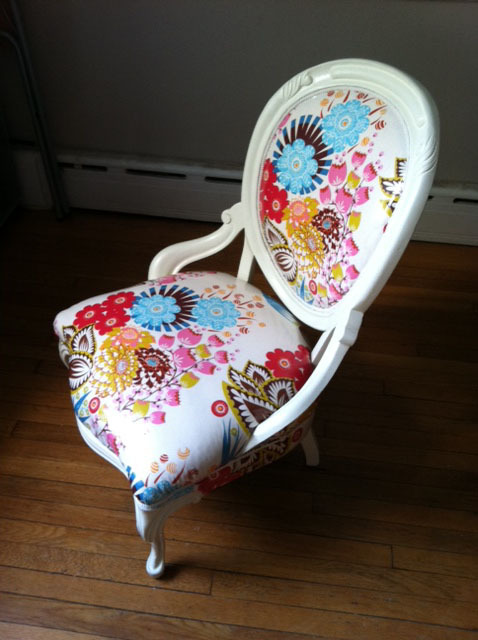 I had used some to re-do these outdoor chairs and it is awesome. 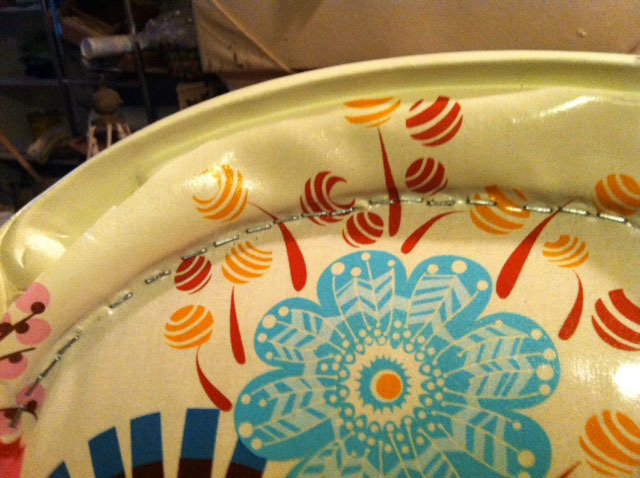 It is thinner than oil cloth, so it’s easier to work with, but the laminate protects the fabric in a similar way. I knew just where to go for all things oil cloth and a huge selection of laminated cotton – Modern June. Anyone can shop her Etsy store but she is conveniently located in Richmond so I arranged to pick up the fabric and save on shipping. With all my supplies in hand I was ready to get started. 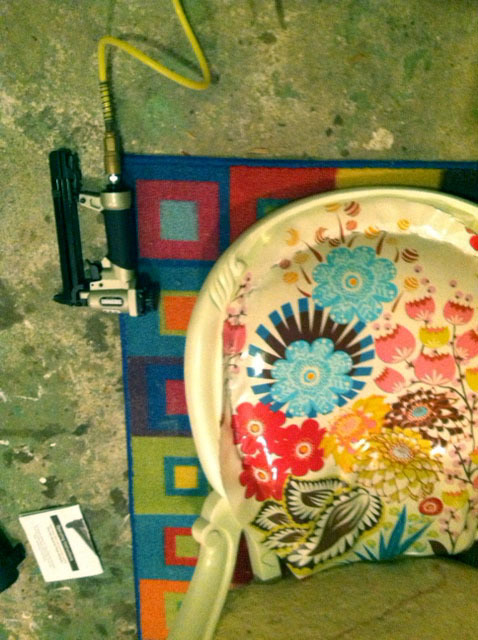 I was super excited, and a little nervous, to use my new super powerful upholstery staple gun. 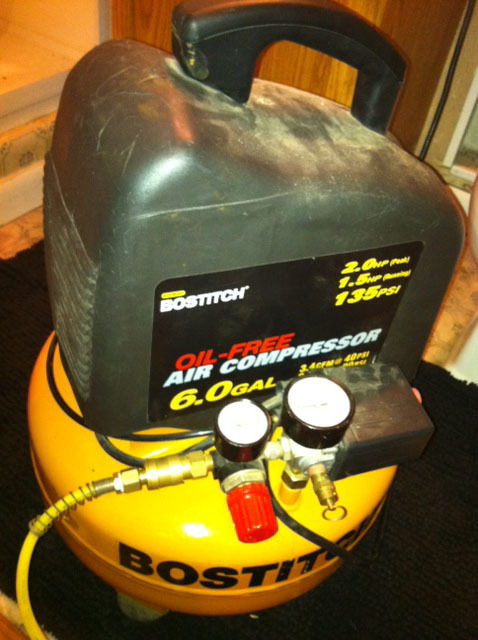 I borrowed my “best neighbor in the world” Bill’s air compressor and got started. I was a little scared about all this new power but a couple minutes into it I was totally hooked. Power tools rock! I cut out my fabric too big, and cut off the extra once it was stapled. It helps to have some extra fabric to pull on when you are trying to get things tight. I put all the fabric on and then glued on the trim. This makes it sound so easy but there is much more involved. I think the hardest part is getting the fabric to look smooth and the necessary creases to not be too noticeable. Here she is all finished. I am so pleased with how it turned out! And I think Courtney is pretty happy too! Jasper likes to try out all my chairs for me. He is a great helper! OMG!!! That’s the most A.M.A.Z.I.N.G. thing I’ve ever seen!!! Oh I love it! 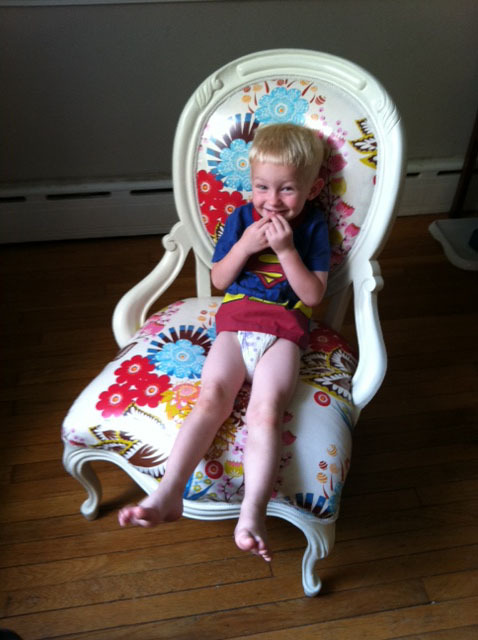 My mom has a chair just like that in their fancy living room but it’s unpainted. I love this version so much better and that fabric is gorgeous! You did a really professional job! Seriously amazing. I love this so much! Courtney’s daughter is one lucky girl! I glued the trim on. I have read that you should use a hot glue gun but they kind of scare me with all those glue strings! So I used a quick dry fabric glue. And on another note – do you have paints just sitting out on your easel?!?!? Jasper must have more self-control than my girl! Um, no. The paints are actually in a locked cabinet. He has access to the chalk and the dry erase crayons, which are awesome by the way! You did an amazing job on this, Karen. It looks totally awesome. Super job! okay I absolutely LOVE this. You are so talented! I love all the colors!!!!!! just discovered your lovely creation. 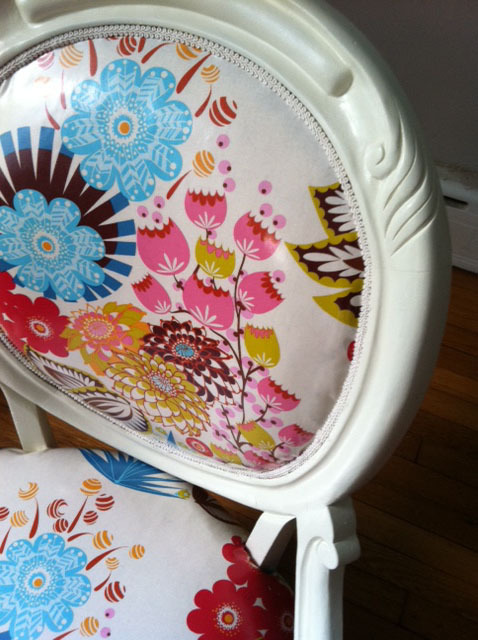 I’m making over my dining chairs, love the patterned fabric but is it still available to buy? 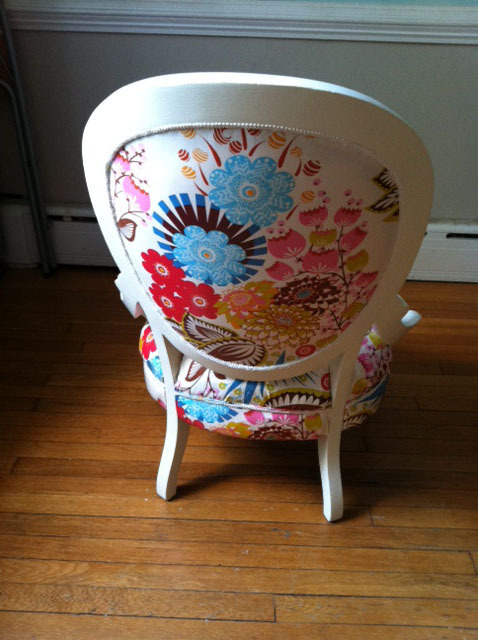 Where is the fabric from I want some for my chair re-do?? ?